This is an invaluable bit of kitchen wisdom imparted to me by the late Carl Sontheimer of the original Cuisinart food processor. He once told me that adding powdered milk to mixtures such as marzipan results in a more velvety smoothness. I've since noticed the presence of dry milk on the labels of many ingredients. And recently I tried adding it to yogurt to see if it would soften the intensity of the lactic acid. I was amazed how just a small amount of the dry milk powder made the yogurt creamier and deliciously mellow. 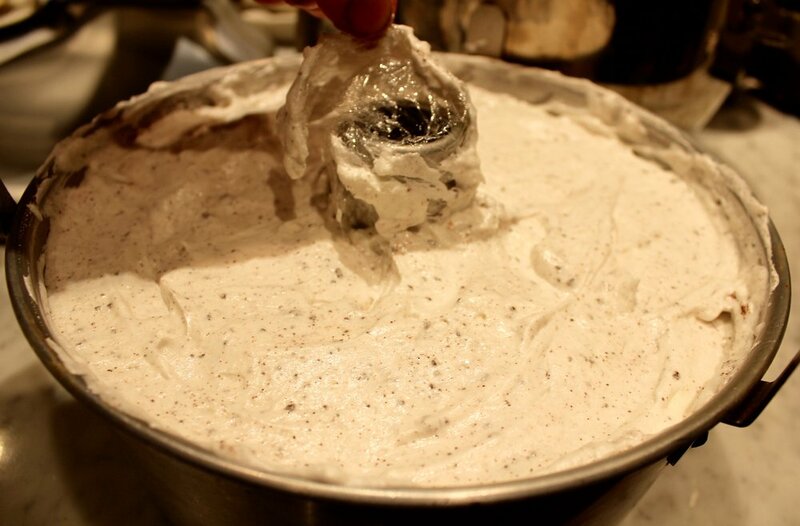 One of the important uses of dry milk I value the most is its addition to bread dough. I've experimented with "instant" dry milk and King Arthur's "Baker's Special Dry Milk. Their dry milk not only adds a smoother and more mellow flavor, it also results in a more tender texture and a significantly higher rise. Unlike "instant" dry milk, which is intended to be reconstituted and processed at low heat, the "Baker's Special Dry Milk" is heated during production to a high enough temperature to deactivate the enzyme protease, which impairs yeast production and, what is most critical, gluten formation and structure. This variety of dry milk will not reconstitute in liquid so it must be added to the flour. The high heat process also produces an exceptionally fine powder, which disperses uniformly through the dry ingredients. Because the particles are so much finer than the more crystalline ones of "instant dry milk," they pack down when measuring in a cup so if replacing "Baker's Special Dry Milk" with "instant" dry milk by volume you will need double the amount to arrive at the same weight. To substitute it for regular milk in recipes, use 1/4 cup of "Baker's Special Dry Milk" or 1/2 cup "instant" dry milk (1.4 ounces/40 grams) plus 1 cup/8.3 ml/8.3 ounces/237 grams of water per cup of milk. Up to 8.2 percent of the weight of the flour is the recommended amount; I use 6 percent in my soft white sandwich loaves. 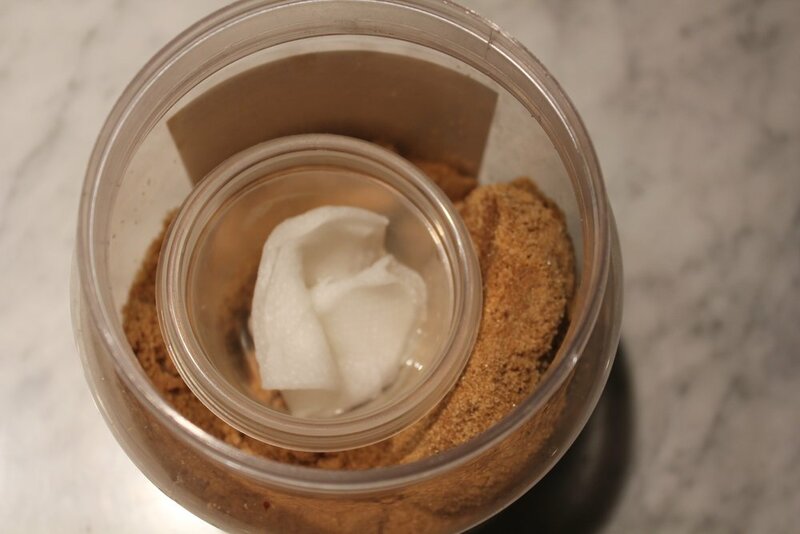 After we open a bag of brown sugar, we transfer the sugar into Ball jars or other airtight containers. 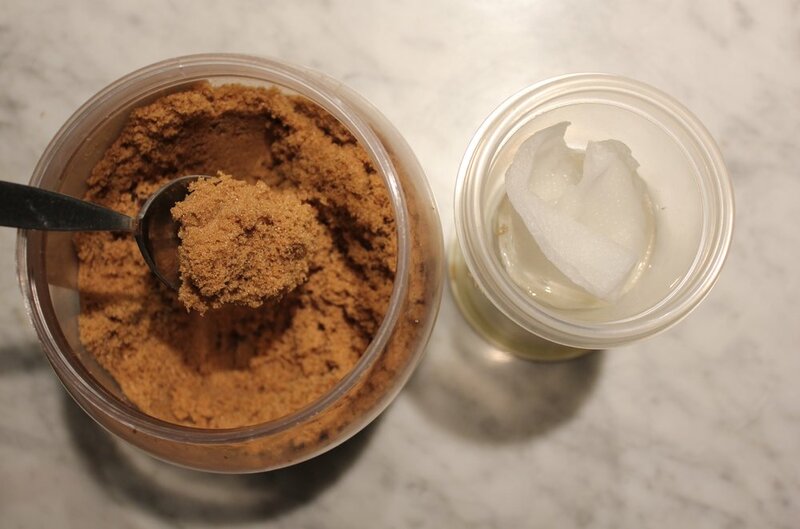 Over time, even in an airtight container, brown sugar can harden and/or start to turn white (as the sugar dries, some of the molasses separates. 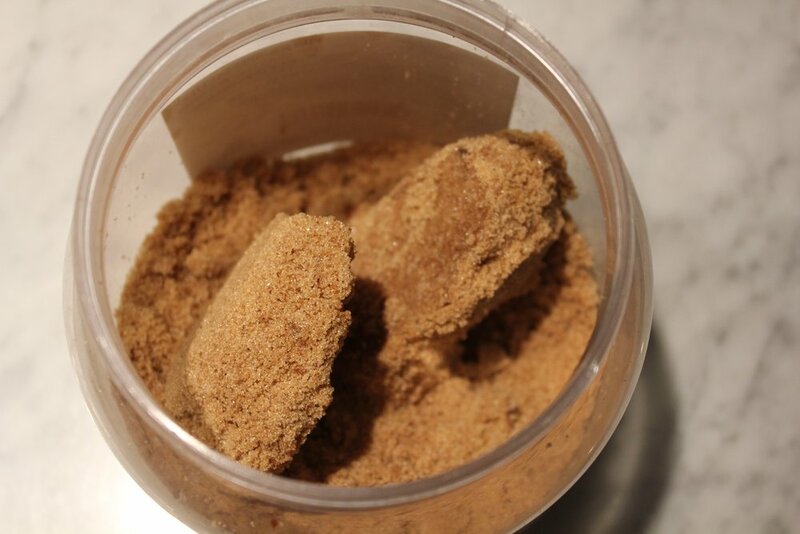 Creating a humid environment will allow the brown sugar to rehydrate to become pliable and brown. 1. Break up the brown sugar as much as possible. 3. 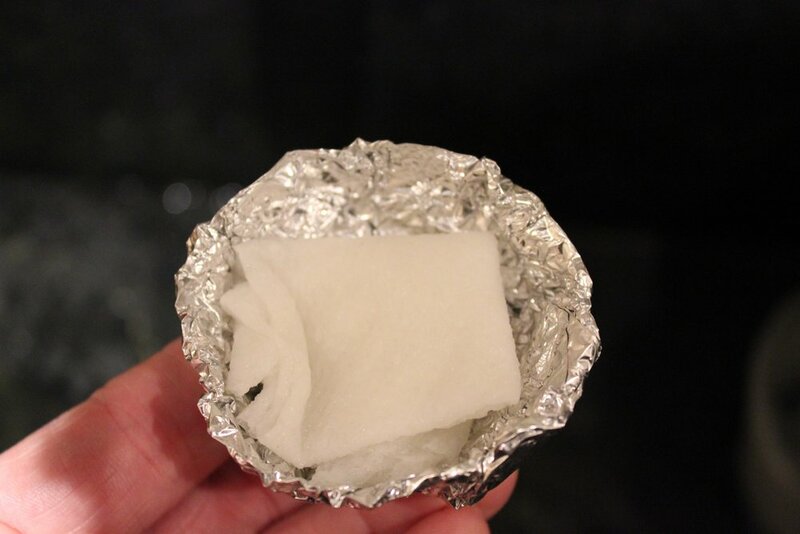 Crumple up a small piece of paper towel and saturate it with water. Set it in the cup. 4. Set the cup on top of the sugar, where it will not tip over. 5. Re-attach the sugar container’s cover. 6. Allow the brown sugar to hydrate for several hours, and remove the cup. If necessary, remoisten the paper towel and continue rehydrating the sugar. Before zesting a lemon, orange, or other citrus fruit, you should first wash the fruit with a scrubby soaked with warm water and dish washing detergent to remove any sprayed on preservative coating. Then dry the fruit completely. 1. 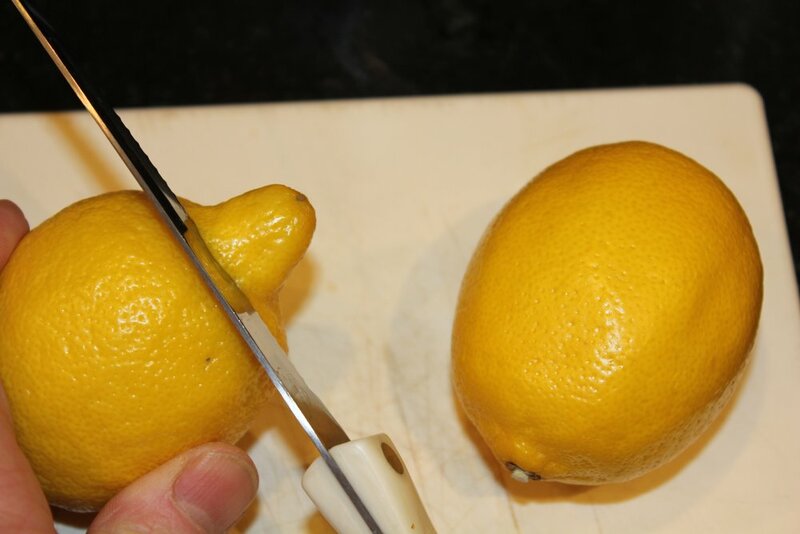 Cutting off the protruding ends on the fruit makes it easier to zest. 2. 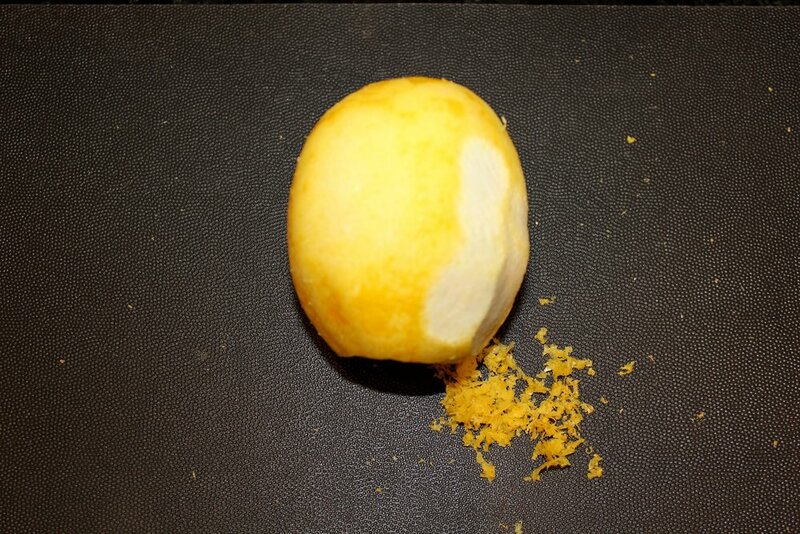 Zesting with a microplane is the best method for shaving off finely grated shavings of just the fruit’s outer peel. Avoid zesting the pith (the white flesh between the peel and the fruit ), which is very bitter. 3. 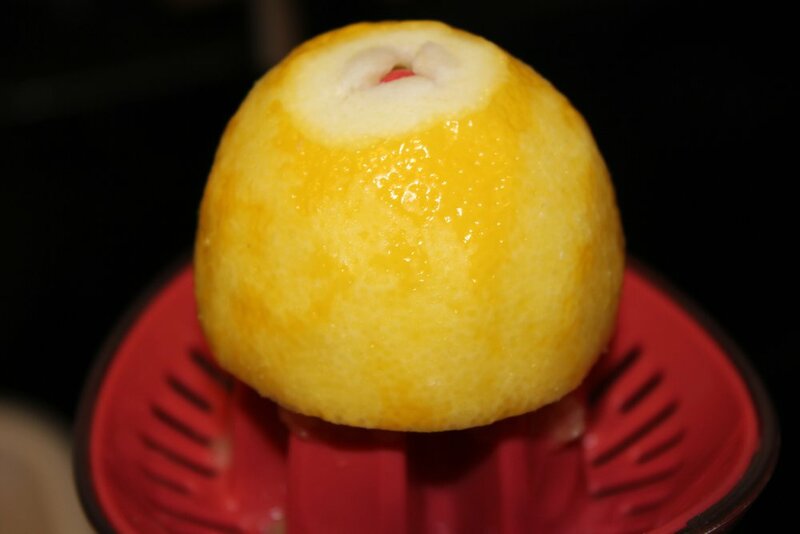 With the protruded ends removed, you also can extract more juice. Last week we were about to use a new nonstick cake pan with its information label still attached that we had bought a few months before. We peeled off the information label, but four patches of hardened on rubbery glue remained firmly attached. Using a scrubby pad with dish soap and elbow grease did not remove the resilient last smears of glue. Using Goo Gone or similar products was vetoed, for fear it food destroy the non-stick finish. 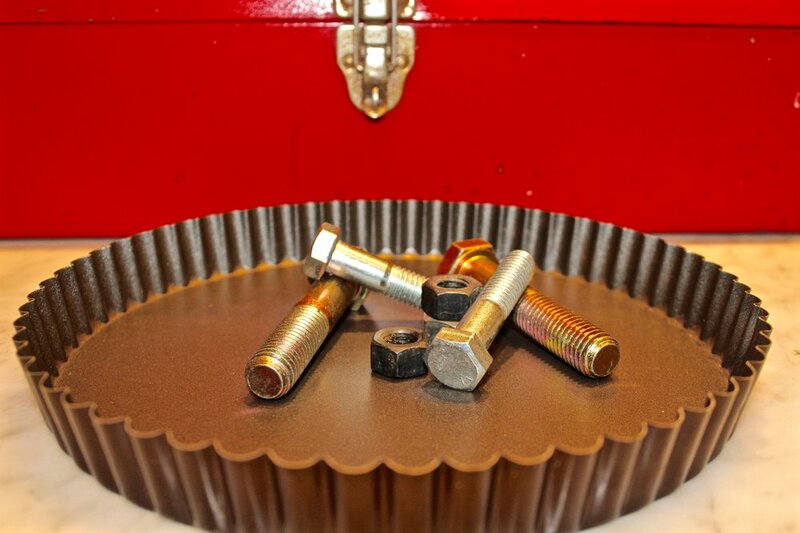 Having been a handyman maintenance manager for many years, I had never heard of this idea. With strapping tape wrapped around two fingers, I rubbed and rolled the tape over the glue smears. Like magic, the smears became smaller and smaller, and the tape became blackened with the removed glue. It took two more rounds of strapping tape and a washing of the pan to get all of glue off. There is a big difference in the weight of flour, depending on which method is used. 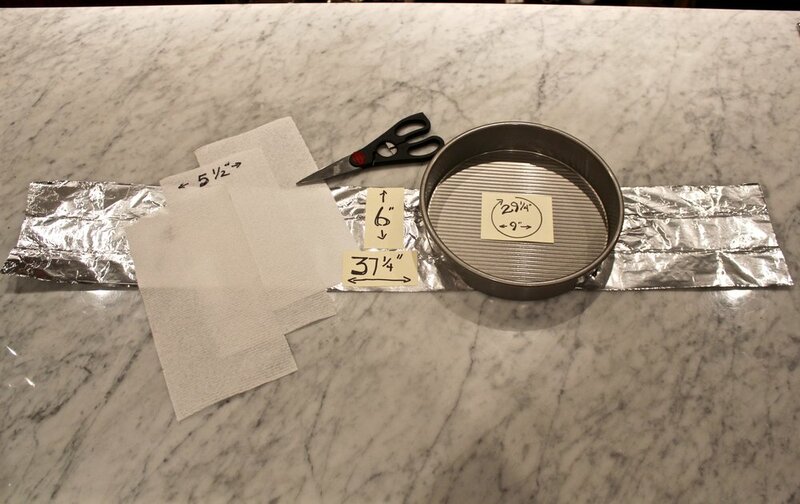 For this tip, we are measuring bleached all-purpose flour. Method One: 1 cup flour, sifted means: you put the flour into the measuring cup and then sift it onto parchment or onto a mixture. This can vary depending on which method you use to measure out the flour: dip & sweep into a cup, or lightly spooned into the cup. 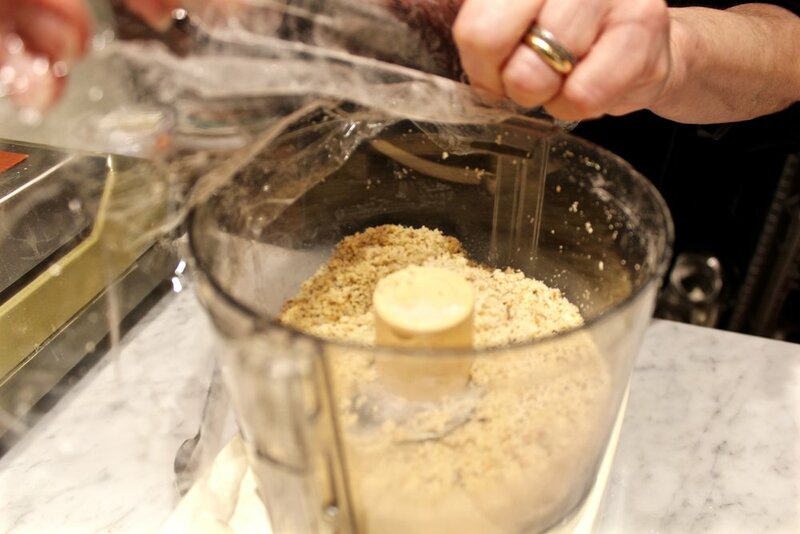 Method Two: 1 cup sifted flour means: you set the measuring cup on the counter and sift the flour into the cup. Before measuring for any method, it is best to stir the flour lightly in its container or bag. Let the flour mound slightly above the top the cup’s rim. 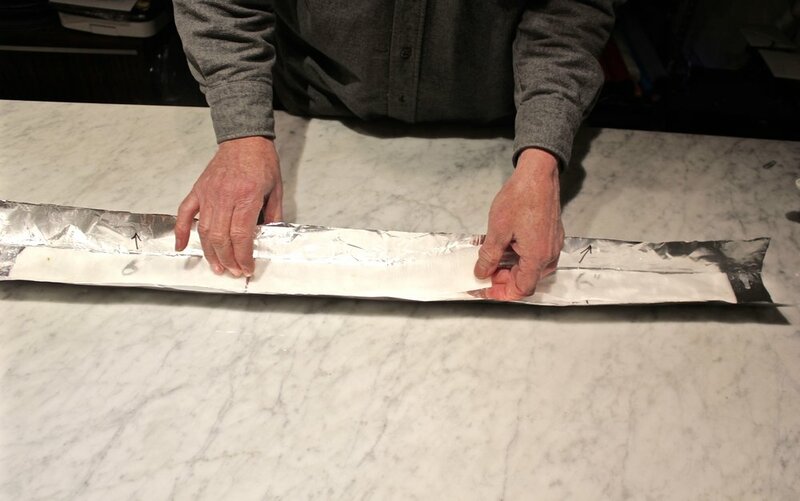 Then, with a metal spatula or knife, level it off. Be sure to use a cup with an unbroken rim, referred to as a dry measure as opposed to a liquid measure, which has a spout. Do not be tempted to shake the cup or tap it as that compacts the flour. 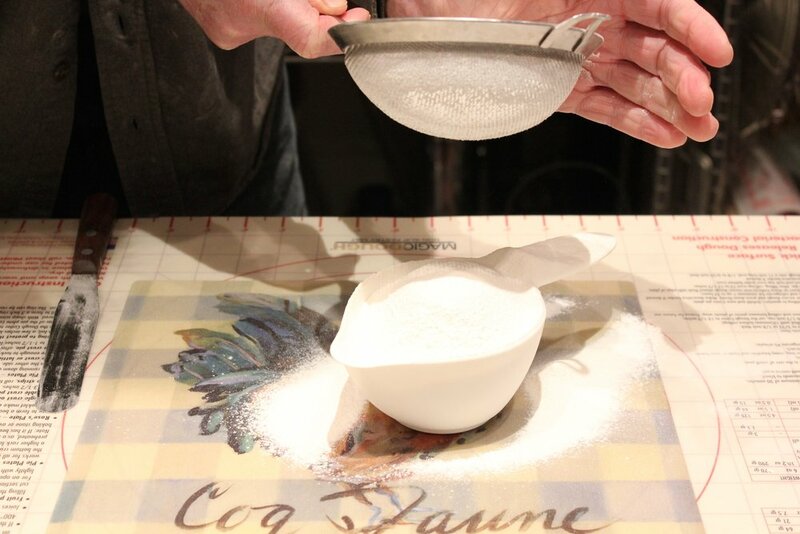 For this tip, for Method One, using bleached all-purpose four, we are showing the weight for 1 cup flour using the dip & sweep method, and then sifted onto parchment. 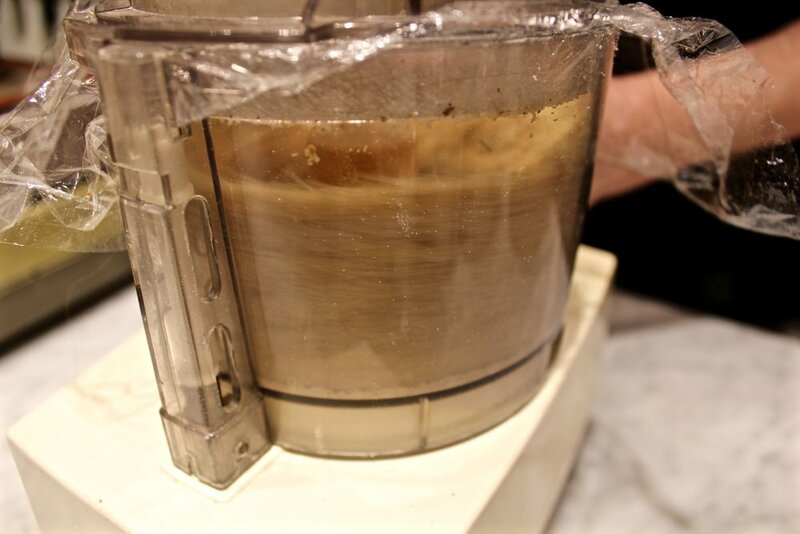 For Method Two, you will have the least amount of flour because the flour is aerated. 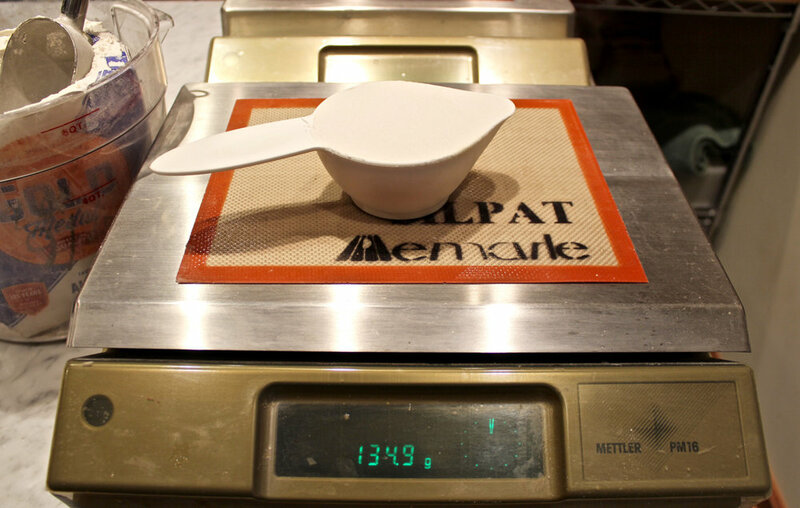 However, if the author states how the flour is measured into the cup before sifting, using the above weights, you can simply sift the flour onto parchment or a bowl on the scale, until you reach the correct weight. For this example, 1 cup by dip and sweep was specified. What is the difference between 1 cup flour, sifted, and 1 cup sifted flour? A convenient method for finely chopping herbs for savory baking recipes is to use a small kitchen scissors and a Pyrex custard cup. After washing and drying the leaves to be chopped, fill the custard cup about halfway full. Then use the scissors to ‘chop’ the herbs to your desired size. 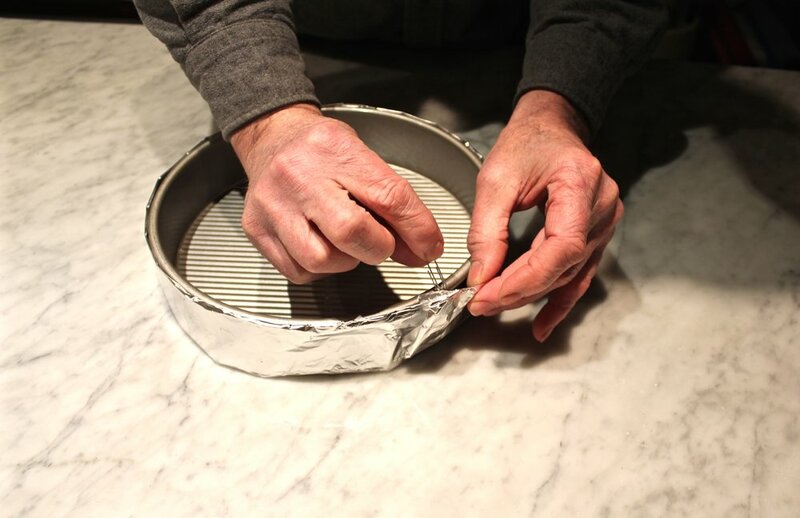 While you are ‘chopping,’ it helps to change the angle of the bowl to the scissors, from time to time, as well as to move the scissors with short pecking like strokes. One of the benefits of weighing your completed cake batter, bread, cookie, or pie dough is to see if maybe you forgot an ingredient. Prior to working with Rose, I made a glorious 10 inch round pumpkin cheesecake for the family Thanksgiving: glorious until I tasted it and realized that only someone, being me, would be eating it, since I forgot to include the sugar. Virtually all of our baking kitchen recipe sheets have the total of the ingredients written above their charts. We also start a recipe with a mise en place (set up for ingredients), in which we stage the ingredients on our counter top before starting the recipe’s instructions. Our example here is for our English Dried Fruit Cake from The Baking Bible, in which the ingredients add up to 1854 grams. 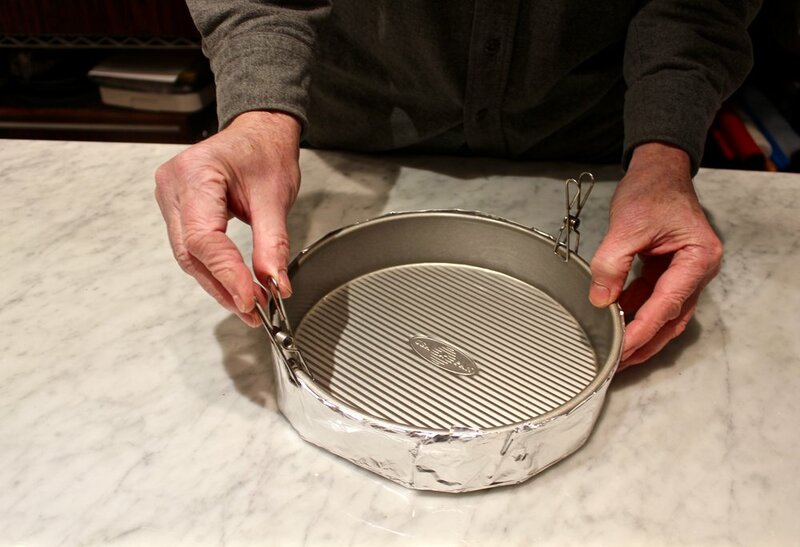 Prior to filling the cake pan, we ‘tared’ out the pan’s weight. 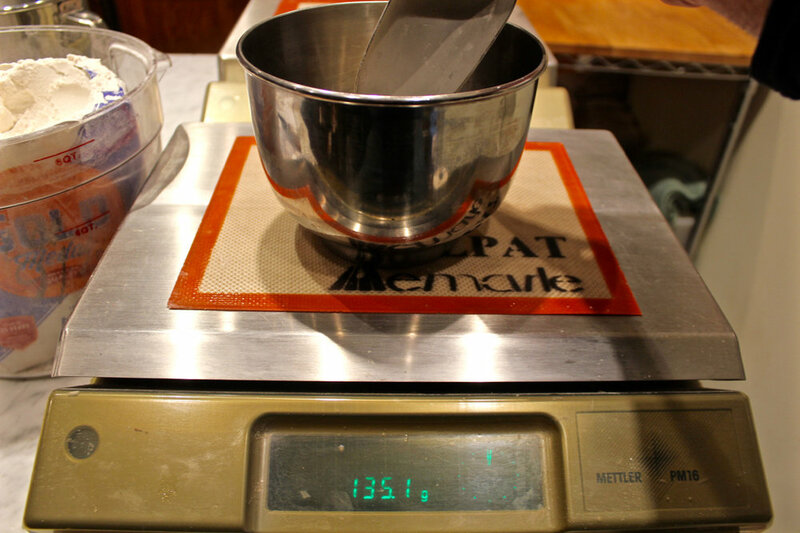 Our cake batter weighed in at 1837.7 grams, which allows for a small percentage of loss from batter still clinging to the beater and bowl. So we knew we could pop it into the oven with total confidence. 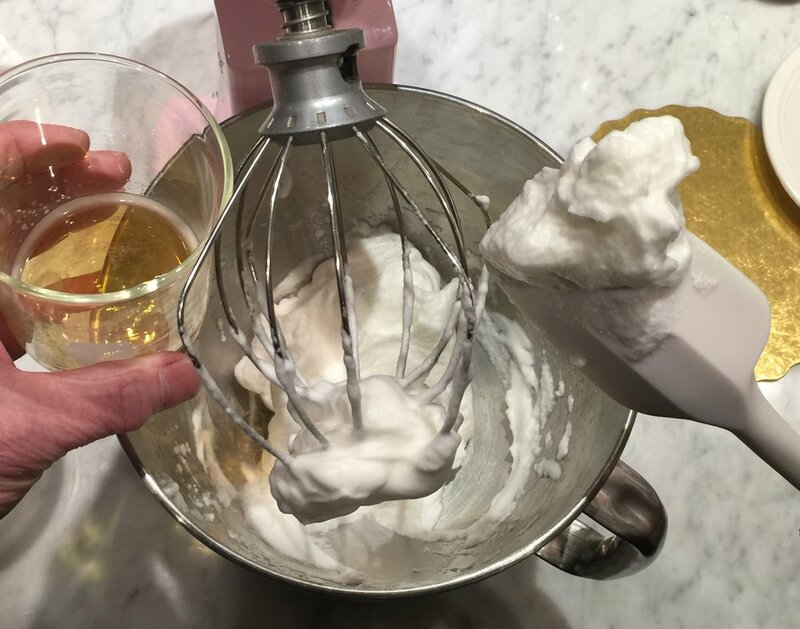 Depending on the recipe, you may be able to mix in a missing ingredient. (Hopefully the discrepancy amount will flag an ingredient’s amount.) Or you can make the choice to bake it and cross your fingers, OR toss it out and start over. Expiration dates or ‘best by’ (aka shelf-life) for baking products, refers to the manufacturers’ recommended date for quality. This does not take into consideration the temperature or environment at which the product is stored. Storage is a major factor affecting shelf-life. If the product can be stored at room temperature, there is a wide range of possibilities including humidity levels. Cocoa, for example, if stored in an air-tight container in a dark area below 70˚F/21˚C, can keep for many years. Unbleached flour and whole wheat flour can be stored at room temperature, but refrigerating or freezing the flour will extend the shelf-life considerably. (Unbleached flour will gradually loose its gluten forming potential, while whole wheat flour will develop rancidity on improper storage). If the product requires refrigeration and your refrigerator is opened often or runs more on the upper side of the recommended temperature range, it will shorten the shelf life. Freezers also vary greatly in temperature. Butter, for example, keeps well past the expiration date in a freezer that is -5˚F/-20˚C. Oxidation is yet another factor in shelf-life and can be retarded by vacuum sealing products such as chocolate. 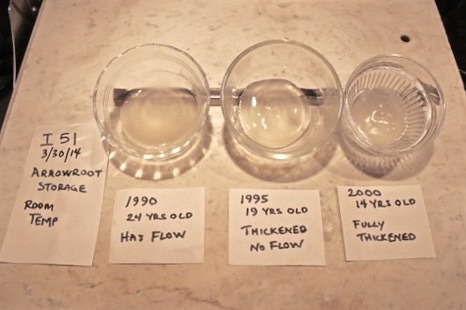 Contamination is also a factor in shelf life. Corn syrup, for example, can ferment if one dips a finger or spoon into the container. When it comes to shelf-life, use your best judgment and taste buds and if there are any concerns, contact the manufacturer.